You want to make a film, develop software or, in general, start a business that requires the people working for you to create works that have intangible value and are copyrightable. How do you ensure that you and your company retains the copyright to the work instead of the people you hired to create it? The answer to that question lies in the type of worker the people creating the works for you are. They are either an employee or an independent contractor. An employee automatically gives rise to a work-for-hire status for all works created by the employee in the scope of her or his employment. That status converts the worker's product into a “work made for hire” i.e. a work created by an employee as part of the job's duties. As for the works of independent contractors, in some limited circumstances, the work-for-hire status can arise when parties agree in writing that the work created by an independent contractor should be considered a work-for-hire. Works made for hire are deemed authored by the employer (or by the party hiring the independent contractor) for copyright purposes, rather than by the actual employee or contractor who created them. Due to the requirements and costs in designating workers as employees and the fact that you may only need those workers for short-term or special gigs, many workers you hire will likely be independent contractors instead. In that event, the contract governing your relationship with these independent contractors assumes utmost importance. 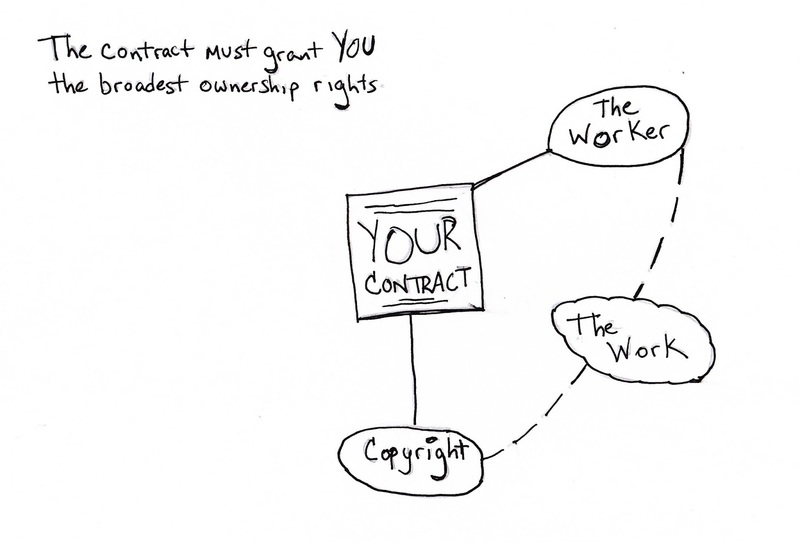 According to the Copyright Act, for independent contractors, only certain works can be designated as works-for-hire contractually including, but not limited to, “a work specially ordered or commissioned for use as a contribution to a collective work.” To strengthen this work-for-hire characterization, you should have a clause in your agreement that ensures a complete copyright transfer in the event that a court or an agency like the IRS determines that work-for-hire provisions do not apply. The main point is that failing to have a properly drafted work-for-hire and copyright transfer clause in your agreements may put your copyright ownership rights in the works you commission or purchase at risk. To play it safe, ensure that any work-for-hire clauses you intend to use, or currently use, are drafted and/or revised in a way that grants you the broadest and most complete ownership rights possible. If you have more questions about this matter or require the drafting, review and/or negotiation of work-for-hire clauses and/or related agreements, please e-mail me at danny(at)djimlaw(dot)com, or call me at (929) 322-DJIM(3546). Danny Jiminian specializes in entertainment law, intellectual property, business law and nonprofits. He is very good at what he does and knows his stuff. For a free consultation, email him.